Bird's Eye Gilia Tricolor is an annual wildflower native to California. Bird's Eye seeds are very easy to grow, and they can be started directly outdoors in spring. 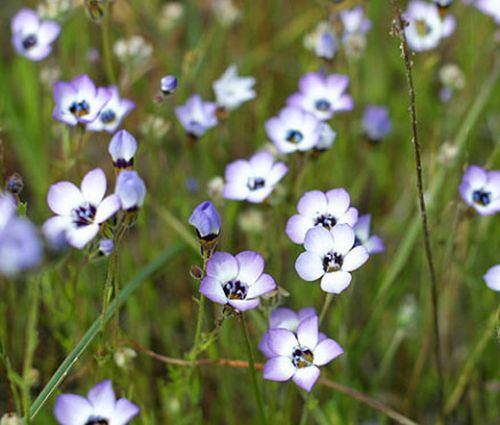 The growing Gilia Tricolor bears scented, trumpet-shaped, pale-lavender to pink flowers with violet and golden throats and prominent blue stamens. This beautiful flower has a delightful chocolate fragrance, so its tube-shaped and fragrant flowers are a favorite of hummingbirds, bees, and butterflies. Bird's Eye flower looks great in any type of garden, and this Gilia plant can be grown in borders, naturalized areas, pots, containers. Gilia Tricolor seeds need light to germinate, so they have to be just slightly pressed into the soil without covering, and the Bird's Eye plant re-seeds itself freely. This wildflower has a long flowering period, and it is tolerant of neglect. Bird's Eye Gilia is a fantastic fresh or dry cut flower that looks marvelous in bouquets, and when this flower is dried, it retains its color.